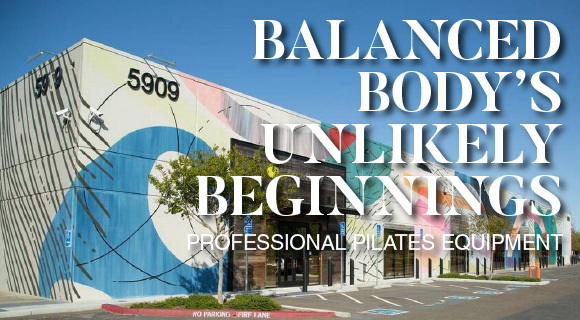 Balanced Body founder Ken Endelman kept saying no to custom equipment requests right up until he became the world’s largest supplier of Pilates equipment. The story about the California native, who grew up just outside of Los Angeles and now lives in Sacramento, credits a life-long interest in working with his hands for the company’s current success. Endelman was building frames for a waterbed company in the mid-‘70s that was on its way down when a customer first asked him to create a Pilates reformer for her personal practice. He agreed, without giving it much thought. After finally taking a look at the apparatus he’d agreed to reproduce, which he’d put off as long as he could, he saw plenty of room for improvement, and the enterprise that began as a series of one-at-a-time orders for custom equipment today sits leads the pack of manufacturers of professional Pilates machines. Balanced Body equipment reflects the founder’s reputation as a builder of fine furniture, from the doweled joinery of the reformer to the rock maple, one of the hardest woods available, used for the frame. The glued dowel joinery keeps the frames perfectly aligned for a lifetime of hard, everyday use. Attention to detail and nearly indestructible construction are the hallmarks of Balanced Body’s professional line of Pilates apparatus. In the nearly five decades the company’s been in business, Engelman has accumulated 28 separate patents for Balanced Body Pilates equipment, including the Revo Springbar reformer adjuster that maintains constant spring tension for the carriage in various seating configurations. This is why when you work out at Your Pilates Lifestyle, you’re working out on the best equipment available. This entry was posted in Uncategorized and tagged balanced body, equipment, reformer, studio on June 14, 2017 by Susan. The Pilates Arc by Balanced Body is a fascinating piece of equipment that took the existing Joseph Pilates original design and adapted it for contemporary use. Weighing only a few ounces, it’s mostly encountered as part of a vigorous floor routine that focuses on spine flexion. Pair it with the Reformer, and students get an entirely new dimension that’s quickly felt as virtually every part of the body gets a welcome stretch in addition to a new challenge. If you haven’t yet experienced the Pilates Arc and are interested in the many benefits it can provide, ask about including it in your next Private or Duet. YPL also has a dedicated Arc class – check the schedule for times. 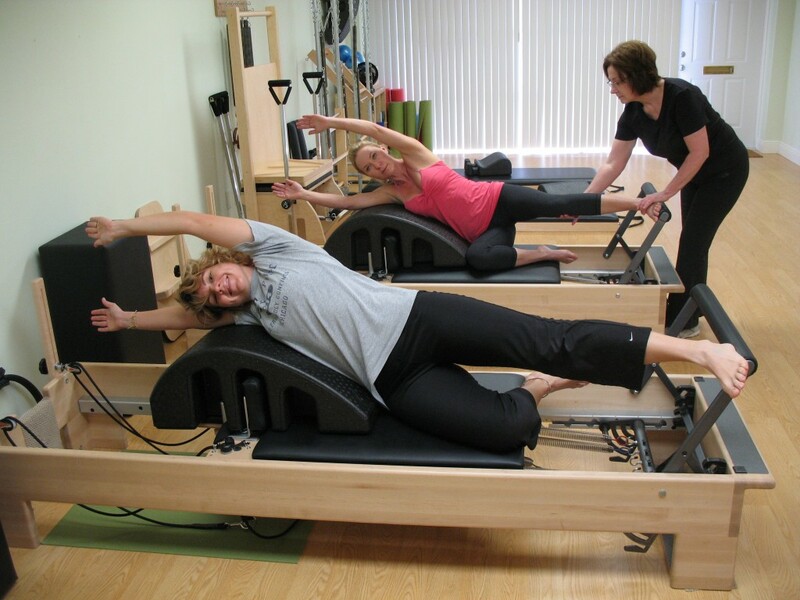 This entry was posted in Uncategorized and tagged Pilates Arc, reformer, stretching on October 2, 2012 by Susan. This entry was posted in Uncategorized and tagged Pilates, reformer, springs, storage, tower on January 18, 2012 by Susan. Cardio AND Pilates? Just Add Jumpboard To Your Reformer Practice! Pilates enthusiasts seldom associate cardio with Pilates, but the truth is a complete Pilates workout will get your cardiovascular system working just as efficiently as any treadmill, stairstep, or elliptical trainer, and with more core control as a bonus. 2) The addition of a jumpboard session at the beginning of your workout as a warm up or as the grand finale is a more contemporary approach. If you’re not familiar with a Pilates jumpboard, it’s exactly what it sounds like! 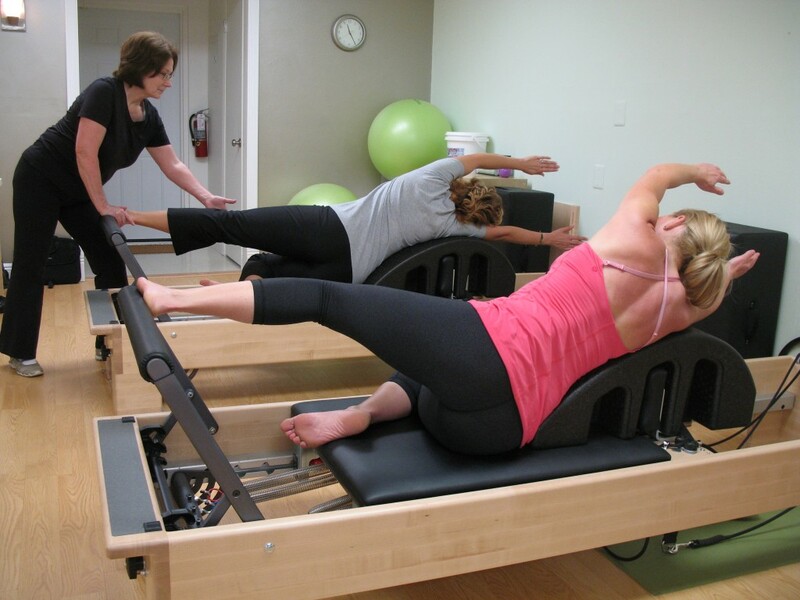 A slightly padded custom designed board is inserted into the end of the reformer. You lie on your back on the reformer mat with light to moderate spring settings and yep, you guessed it, JUMP! The jumping can include simple jumping and running or can move into more dance type choreographed routines. The addition of hand weights or Therabands takes the cardio up another notch! Whether you choose to include either of these options in your session is a personal preference. You can always opt for separate cardio training like walking, running in the park or at the beach, or hitting the treadmill at the gym, but if you want it all in one low-impact session, a Pilates jumpboard is the ticket to a healthy, beneficial cardio experience. This entry was posted in Classes and tagged cardio, jump board, Pilates, reformer on September 13, 2011 by Susan. When Joseph Pilates designed the original Reformer, students were built much differently then they are today. Today’s typical Pilates student comes in a much wider range of body shapes and styles than those original pioneers. One of the major drawbacks of the original Reformer design is that it doesn’t easily allow for adjustment to the wide variation found in a modern studio’s clients’ height, which can mean a difference of a foot or more! 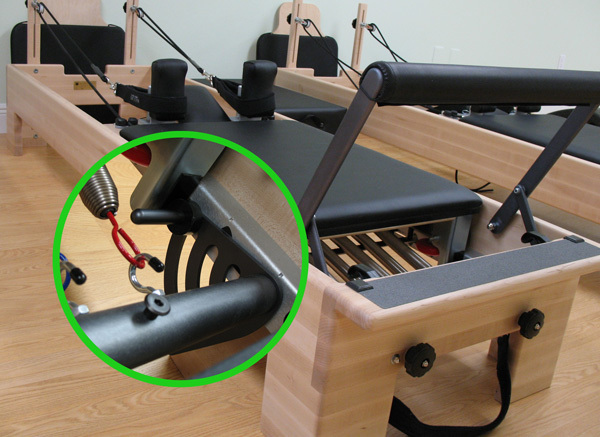 Our custom built Balanced Body Reformers feature the innovative Revo Adjustment System (see photo inset), a multi-position locking mechanism for quickly and accurately moving the carriage (mat portion) of the Reformer in or out on the chassis, based on a student’s height and range of motion. This allows the spring bar (which offers the resistance) to move in unison with the carriage to maintain the proper no-load (neutral) initial spring tension while performing the exercises and providing the adjustability needed to create the best ergonomically correct position for every client. Without the Revo Adjustment System, the client that’s 6’2″ and the client that’s 5’3″ must both begin from the same position relative to the foot bar, creating imbalance and an unequal range of motion and spring tension. 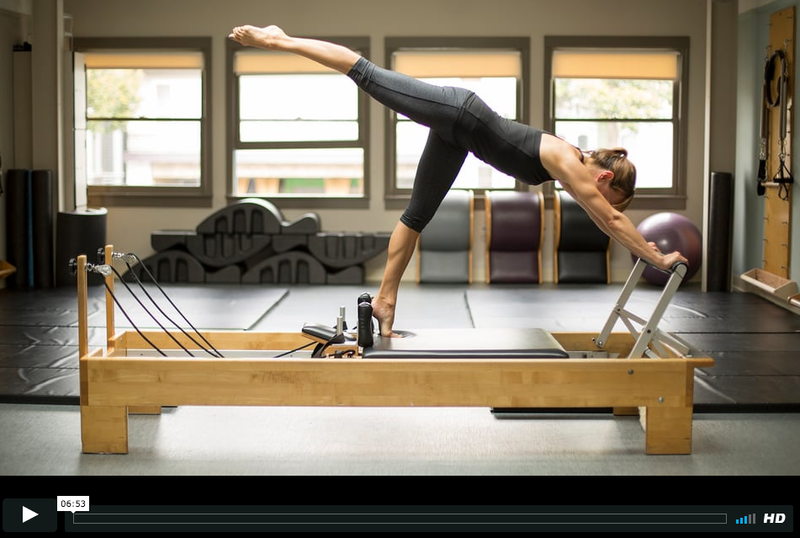 This unique feature means our students get the full benefit of a reformer class without having to compromise form over fit. It’s a perfect combination of comfort and efficiency. This entry was posted in Classes and tagged balanced body, fitness, Pilates, reformer, revo on August 26, 2011 by Susan. That’s what the reporter in this video said is a primary benefit of her newly discovered Pilates practice. I thought this short (five minute) news report was interesting, informative, and might help take some of the scary out of Pilates. Not everyone will reach the level of a master instructor (and there aren’t that many that reach that level) but everyone can feel stronger, more flexible and physically fit, and achieve an overall sense of wellbeing through the practice of the Pilates method. If your browser doesn’t display the Flash video, just follow this YouTube link. This entry was posted in Classes and tagged fitness, instruction, Joseph Pilates, Pilates, reformer on July 28, 2011 by Susan. If you’re a runner, should you incorporate Pilates as part of your training? At YPL we think so, and have a number of clients who run 5Ks to longer events like half-marathons. One of the more common questions I get asked is whether Pilates should be part of a runner’s training. 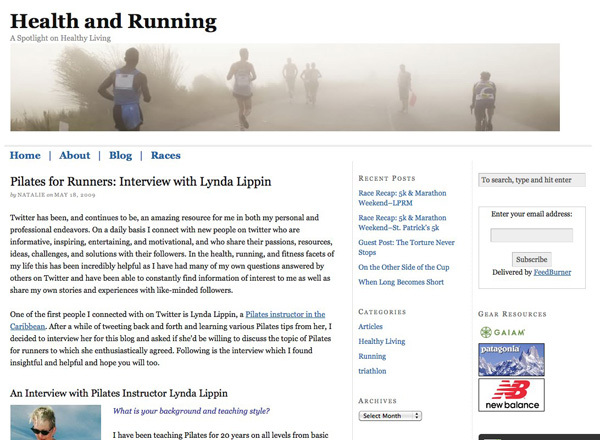 You can Google Pilates+running and find a lot of answers. Here’s one of the better comments I’ve found on the subject, in the Health and Running blog. One of the things I’ve heard that Pilates does best whenever the discussion is about running goes back to core strength and how that allows for better posture during the run. Other movements, like the kneeling front split, are of great benefit as a hip opener and hamstring stretch. The New York Times published an amazing article this week that ran in the local St. Petersburg Times about a marathoner who was diagnosed with a cancerous hamstring and just months after having it removed was again winning races! Talk about adversity! This entry was posted in Uncategorized and tagged hip opener, Pilates, reformer, running, stretching on March 25, 2011 by Susan.